The ABILITY to see the market as it is, instead of how you WANT it to be (or FEAR it to be), is one of the secret skills of the SUCCESSFUL trader. Price action is one of the best ways to stay objective. I have used different trading strategies and methods and most of the time they are ineffective. The most logical question you will be asking by now is WHY??? Why trading price action is so powerful? Why I have so many articles about price action? Why is it so hard to learn and practice correctly? All those questions and much more are asked on a regular basis by traders who are just starting to learn how to trade with price action. In my trading course I have covered all topics that are worth mentioning and that can help you become consistent in trading. I believe that price action has been the one and only tool that helped me become consistently profitable. Of corse there is money management and risk management. Surely you need to possess tremendous doses of trading discipline. Trading is certainly not a quick road to riches. Learning price action gives us more than it takes and that is why it will continue to be the best trading method I have ever know. Unlike other methods, price action is considered to be a very simple trading approach. That is certainly one of the biggest misconceptions about price action. First of all, trading price action is very easy to get started with. But then the resistance comes in and this is when the hard part begins. Although it looks like limited in its scope, price action is limitless. There are so many variants as there are possible outcomes. What makes a price action trader great is his/her ability to be clear with themselves that the goal isn’t to find a better path; it is to find the bravery to change their mind. That is why, it is so easy to fall victim of the trap of the subjectivity of price action trading. REMEMBER: There is nothing more complicated than mastering a simple trading system! There are numerous charlatans out there that want to convince you it is extremely easy to learn any trading strategy (price action included) and then make a bunch of money. It DOES NOT WORK this way! Those are just of the 7 essentials you need to possess before even trying to make it in trading. With or without price action, you need to be prepared to experience a lot of downs before you get on the right track. You need to realise the fact that without a trading mentor you might take twice the time or sometimes even more before you get on the right track of consistency. If you think of it this way- the time and the costly mistakes that a trading mentor can save you might certainly be worth investing into. The truth is that by just being mentored you should not expect to become successful. You should put in the hours and the sweat yourselves and then and only then you should be asking for something in return from the markets. In a nutshell- TRADING IS NOT EASY! You can choose any other trading style. Price action is the style I have chosen and the one that fits my personality. Also, it is the one that I have proven in time that I can consistently win in this game of mental chess! You could choose any other trading style, as long as your P/L proves you are right. I have met so many traders that believe that one trading style is superior to another. They are all wrong! It is all about the trading style that matches your personality and anyone is trying to convince you that you should trade in a particular way is either looking to take your money and sell you something or has just not been around for long enough. Trading is more than just a trading style. Trading is mostly about you! The fourth not so common misconception is that price action trading is only about price. Price action trading is about so many other things and the PRICE. One of the most important elements (maybe even more important than price itself) in trading price action is the concept of support and resistance. Although I highly suggest you follow the link above, the concept of support and resistance is not simple (although a lot of traders like to see it that way). Knowing how to place support and resistance levels correctly is more art than science. Knowing how to use those levels profitably is more about experience than judgement. Nothing is more important in knowing how to use those levels than the rules and your trading discipline. 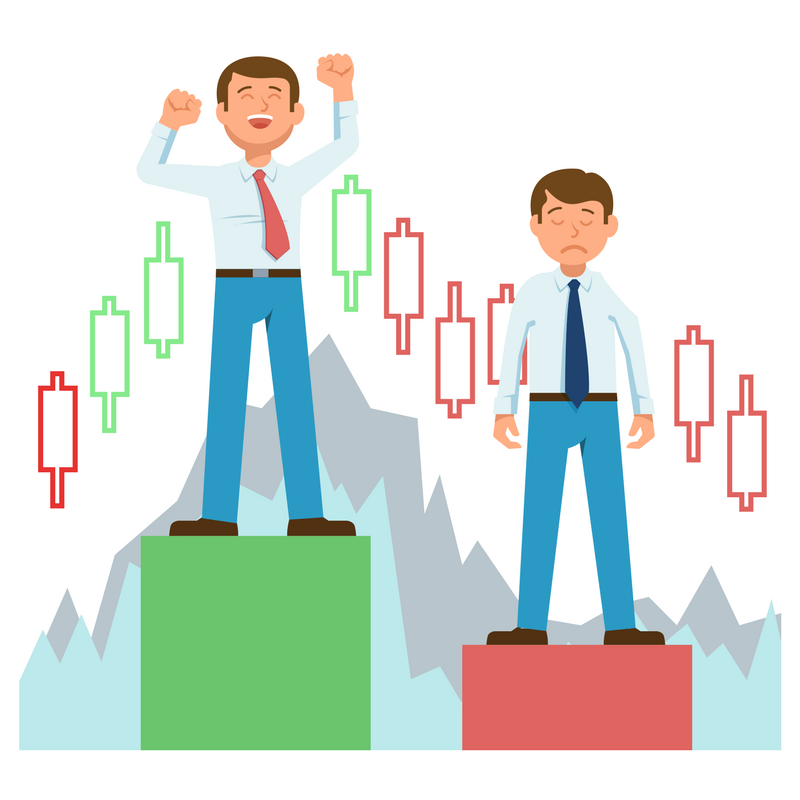 Price action trading includes other elements like Candlestick charts, or even Renko charts. I have explained the concept thoroughly in my trading programme and it is certainly not as straightforward and simple as many would like to believe. Although such an approach might be profitable for a while, there are various reasons why this “follow the trader” behaviour won’t be successful in the long-term. Imagine you are in a winning streak, because the trader you are following is in a winning streak. Even if the trader you are following is great, it does not necessary mean you will make money. There are so many things that can go wrong that you would be much better off if you ask him/her to teach you how to trade. In case you are lucky enough to get their mentorship, then again you are not safe from making some costly mistakes along the way. If you choose this route though, you will at least know that these will be your mistakes and you have no one else to blame and nowhere to hide. The moment when you realise that is when you commence your journey into professional trading. Looking into yourself and improving is where the best form of learning starts. Another very popular misconception about price action trading is that is works on all timeframes. Maybe it will work on other timeframes some of the time. Maybe price action won’t work on 4 hour and Daily charts some of the time. What has proven to work for me in the long-term are those two timeframes mentioned above. You might say- probably you were not patient enough with the smaller timeframes. You could be possibly right, but experience and talking to other traders has confirmed that price action works great on those two timeframes. So, it is up to you to do your experimenting and tweaking until you reach your own perfect combination! Predicting the markets vs. reading them. The seventh widespread misconception about price action trading is encapsulated in the statement above. More often than not traders are willing to imagine candlesticks that are not yet on the chart. For example, you are waiting for a daily candle to close, but at 2pm you decide that a pinbar will form, only to find out a few hours later that the daily candle is a long-legged doji. Patience comes into play here. Traders are spontaneous creatures that are expecting the market to move in a certain direction. Professional traders are always looking to read the market. They don’t expect anything. If a pattern appears they will act upon it. If the pattern does not show up as expected- even better. That is just another great opportunity to test your resilience and show what you are made from. Good traders are never rushing to go into a trade. Price action gives just another angle that helps professionals to more accurately position themselves in an ever-changing scene called “financial markets”. As you have seen from the article above, price action is about a basket of factors including price, as well. The 7 misconceptions about price action has been talked about and argued about for quite some time, so I hope this article clarifies the matter. If there is one thing to take away from the text above, it is that no wonder what trading style you are using, there will always be ups and downs. What makes a great trader in this sense is the ability to manage the down periods in the best possible way and make the most of the upside.